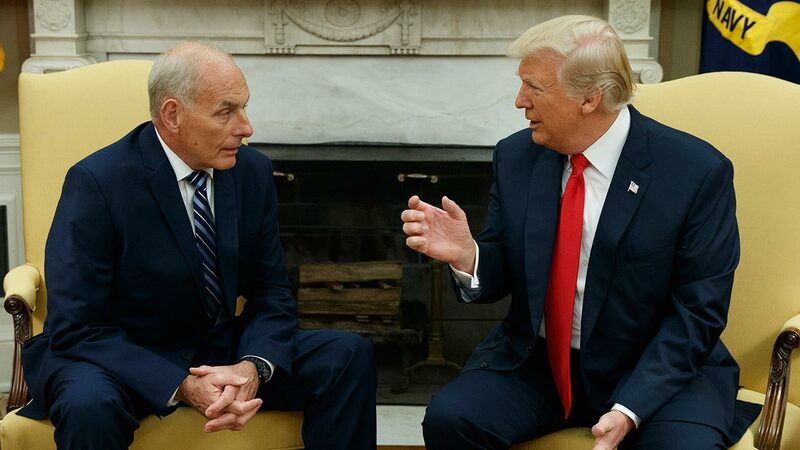 WASHINGTON -- Hoping to turn the page on a tumultuous opening chapter to his presidency, President Donald Trump insisted on Monday there is "no chaos" in his White House as he swore in retired Marine Gen. John Kelly as chief of staff. In an Oval Office ceremony, Trump predicted Kelly, who previously served as Homeland Security chief, would do a "spectacular job." And the president chose to highlight an improving stock market and strong jobs outlook rather than talk about how things need to change under Kelly. Trump on Friday ousted Reince Priebus as chief of staff and turned to Kelly, whom he hopes will bring military discipline to an administration weighed down by a stalled legislative agenda, infighting among West Wing aides and a stack of investigations. While Trump is looking for a reset, he pushed back against criticism of his administration on Twitter Monday. He said: "Highest Stock Market EVER, best economic numbers in years, unemployment lowest in 17 years, wages raising, border secure, S.C.: No WH chaos!" Kelly's success in a chaotic White House will depend on how much authority he is granted and whether Trump's dueling aides will put aside their rivalries to work together. Also unclear is whether a new chief of staff will have any influence over the president's social media histrionics. Former Trump campaign manager Cory Lewandowski, who was ousted from the campaign in June 2016, said on NBC's "Meet the Press" that he expected Kelly would "restore order to the staff" but also stressed that Trump was unlikely to change his style. "I say you have to let Trump be Trump. That is what has made him successful over the last 30 years. That is what the American people voted for," Lewandowski said. "And anybody who thinks they're going to change Donald Trump doesn't know Donald Trump." Kelly's start follows a wild week, marked by a profane tirade from the new communications director, Trump's continued attacks on his attorney general and the failed effort by Senate Republicans to overhaul the nation's health care law. In addition to strain in the West Wing and with Congress, Kelly starts his new job as tensions escalate with North Korea. The United States flew two supersonic bombers over the Korean Peninsula on Sunday in a show of force against North Korea, following the country's latest intercontinental ballistic missile test. The U.S. also said it conducted a successful test of a missile defense system located in Alaska. Sen. Dianne Feinstein, D-Calif., said on CBS' "Face the Nation" that she hopes Kelly can "be effective," and "begin some very serious negotiation with the North and stop this program." Another diplomatic fissure opened Sunday when Russian President Vladimir Putin said the U.S. would have to cut its embassy and consulate staff in Russia by several hundred under new sanctions from Moscow. In a television interview, Putin indicated the cutback was retaliation for new sanctions in a bill passed by Congress and sent to Trump. Trump plans to sign the measure into law, the White House has said. After Putin's remarks, the State Department deemed the cutbacks "a regrettable and uncalled for act" and said officials would assess the impact and how to respond to it. While Trump is trying to refresh his team, he signaled that he does not want to give up the fight on health care. On Twitter Sunday, he said: "Don't give up Republican Senators, the World is watching: Repeal & Replace." The protracted health care fight has slowed Trump's other policy goals, including a tax overhaul and infrastructure investment. But Trump aides made clear that the president still wanted to see action on health care. White House budget director Mick Mulvaney said on CNN's "State of the Union," that senators "need to stay, they need to work, they need to pass something." Asked if nothing should be voted on in Congress until the Senate votes again on health care, Mulvaney said: "well, think - yes. And I think what you're seeing there is the president simply reflecting the mood of the people." On Saturday, Trump threatened to end required payments to insurance companies unless lawmakers repeal and replace the Obama-era health care law. He tweeted that if "a new HealthCare Bill is not approved quickly, BAILOUTS for Insurance Companies and BAILOUTS for Members of Congress will end very soon!" The payments reduce deductibles and co-payments for consumers with modest incomes. Trump has guaranteed the payments through July, but has not made a commitment going forward. White House counselor Kellyanne Conway said on "Fox News Sunday" that Trump would make a decision on the payments this week. Sen. Susan Collins, R-Maine, who opposed the efforts to move a health bill forward this week, said on CNN that cutting the payments would "be detrimental to some of the most vulnerable citizens" and that the threat has "contributed to the instability in the insurance market." The House has begun a five-week recess, while the Senate is scheduled to work two more weeks before a summer break.